I recently received a request from an out-of-state reader who wanted to find information about a neighborhood in Tallahassee and was having trouble. Specifically, she wanted an updated Weems Plantation Home Sales Report and did not know how to find one. I will use this blog post to show you how to get a neighborhood update anywhere in Tallahassee, and then of course will provide a newly updated report on Weems Plantation. There are many ways to find real estate reports on your favorite neighborhood in Tallahassee, but here are the three that I most-often use (I use Weems Plantation as the example, but any Tallahassee neighborhood will do). Favorite Bookmark: This is the master Tallahassee Neighborhoods Page on our website, featuring over 3,000 links to articles and homes for sale in Tallahassee neighborhoods. You should bookmark this link in your browser header, and it will give you immediate access to any neighborhood you want. Direct URL: You can simply go to the navigation bar in your internet browser and type the following, ensuring to use all small characters (no capitalization). You type the base of our website + "/tag" + "/full-neighborhood-name". That is all. For example, you will find the latest Weems Plantation Home Sales Report at "http://www.manausa.com/tag/weems-plantation". Additionally, you can find all the current homes on the market in a neighborhood by typing the base of our website + "/tallahassee-mls" + "/full-neighborhood-name". For example, you will find all 16 of the current listings of homes for sale in Weems Plantation at "/tallahassee-mls/weems-plantation". Google: Go to google.com and simple put this information "weems plantation manausa" and you will be shown a long list of information on Weems Plantation that include my last name. Typically, one of my neighborhood reports will show in the first or second result. By the way, this technique works well for any topic that I have written about. 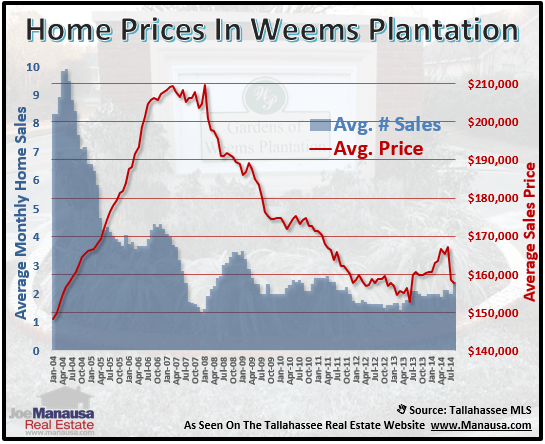 Home prices are on the decline in Weems Plantation.The average home price peaked at $208,760 in 2006, but has declined to a 2011 average sales price of $157,233, which is a 25% decline. The number of home sales is very low compared to the peak of the market, suggesting that Weems Plantation could very well be seeing pent-up supply which could result in faster-than-normal depreciation over the next few years. 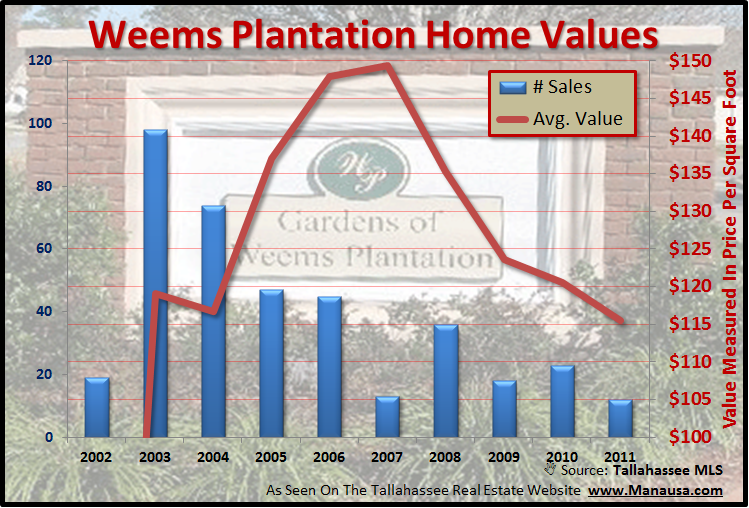 Just like the rest of the Tallahassee real estate market, home values are declining in Weems Plantation. But this popular Tallahassee neighborhood has only seen a 23% value decline since the peak of the housing market, with 2011 home sales averaging $115 per square foot, compared to $149 per square foot measured in 2006. Home sellers should be advised that values will continue to decline until market balance is restored, meaning a quicker sale will often yield the highest home sales price. The following map shows all of the homes for sale in Weems Plantation. Simply hover over a marker and a picture of the home will appear, as well as limited information on the home. If you want to know more about the home, simply click on the picture and the entire detail page will be revealed. I hope you were able to learn something from this Weems Plantation Home Sales Report, please drop me a note if you have any other questions or concerns that I can help you with.